As the Arctic was experiencing a record low minimum extent of summer sea ice, the Antarctic was reaching record high levels of winter sea ice in the satellite record, culminating in a winter maximum extent of 19.44 million square kilometers (7.51 million square miles) on September 26th. The September 2012 monthly average was also a record high, at 19.39 million square kilometers (7.49 million square miles) slightly higher than the previous record in 2006. Temperatures over Antarctica were near average this austral winter. Scientists largely attribute the increase in Antarctic sea ice extent to stronger circumpolar winds, which blow the sea ice outward, increasing extent. Changes in weather circulation patterns related to global warming, caused Antarctic winter sea ice extent to reach a record 19.44 million sq.km. NSIDC scientist Ted Scambos said, “Antarctica's changes in the sea ice in winter are due more to wind than to warmth, because the warming does not take much of the sea ice area above the freezing point during winter". The westerly winds that blow around the continent have become stronger in response to a stubbornly cold continent, and the warming ocean and land to the north. The September extent trend for 1979 to 2012 is just above the statistical significance level (0.9% per decade, plus or minus 0.6%). The new Antarctic sea ice September value is slightly greater than typical year-to-year variations, and is roughly equal to a 40 km (25 mile) northward shift in the location of the ice edge relative to the 1979 to 2000 average. 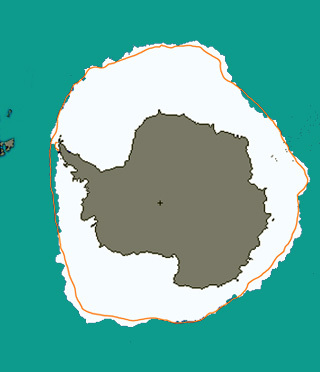 The trend for ice extent growth during Antarctic winters is about 16,000 square kilometers per year (6,200 square miles) or roughly an area the size of Connecticut. In comparison, the decline in Arctic summer sea ice extent is an area about the size of Indiana (91,600 square kilometers per year, or about 35,400 square miles). Right: The graph shows Antarctic sea ice extent as of September 30th, 2012. The 1979 to 2000 average line is in dark gray. The gray area around this average line shows the two standard deviation range of the data. Image: National Snow and Ice Data Center. Above: Antarctic sea ice extent on September 26th, 2012 was 19.44 million sq.km (7.51 million sq.miles). The orange line shows the 1979 to 2000 median extent for that day of the year. The black cross indicates the geographic South Pole. Image: National Snow and Ice Data Center, Boulder, Colorado. According to Dr Sharon Stammerjohn of INSTAAR at the University of Colorado, climate is warming over much of the Antarctic continent, as shown in several studies (e.g., Chapman and Walsh, 2007, Monaghan et al., 2008, Steig et al., 2009) and is related to Pacific Ocean warming (Ding et al., 2010) and circumpolar winds. Warming and ozone loss cause stronger circumpolar winds in the south. This is primarily due to persistently cold conditions prevailing on Antarctica year-round, and a cold stratosphere above Antarctica due to the ozone hole. Stronger winds generally act to blow the sea ice outward, slightly increasing the extent, except in the Antarctic Peninsula region, where due to geography, winds from the north have also increased, pushing the ice southward. Sea ice extent near the northwestern Antarctic Peninsula continues to decline rapidly, while areas in the Ross Sea and southern Indian Ocean show significant increases (Stammerjohn, 2012). Circumpolar-averaged sea ice extent changes nearly cancel each other out for all months of the year (Parkinson and Cavalieri, 2012). Atmospheric conditions were near average overall during the Antarctic winter, with roughly equal areas of cooler and warmer air temperatures over the sea ice. The comparison winter and summer sea ice trends for the north and south poles is problematic since different processes are in effect. During summer, surface melt and ice-albedo feedbacks are in effect; winter processes include snowfall on the sea ice, and wind. Small changes in winter sea ice extent in the Antarctic may be a more mixed signal than the loss of Arctic summer sea ice. An expansion of winter Antarctic ice could be due to stronger winds, or snowfall, whereas Arctic summer sea ice decline is more closely linked to decadal climate warming. Chapman WL, and Walsh JE, 2007. A synthesis of Antarctic temperatures. Journal of Climate 20 (16), 4096-4117. Ding Q, Steig E, Battisi D, and M. Kuttel M, 2011. Winter warming in West Antarctica caused by central tropical Pacific warming. Nature Geoscience 4. Monaghan AJ, Bromwich DH, Chapman W, and Comiso J, 2008. Recent variability and trends of Antarctic nearsurface temperature. Journal of Geophysical Research 113, D04105. Parkinson C, and Cavalieri D, 2012. Antarctic sea ice variability and trends. The Cryosphere 6, 871-880. Stammerjohn S, Massom R, Rind D, and Martinson D, 2012. Regions of rapid sea ice change: an inter-hemispheric seasonal comparison. Geophysical Research Letters 39, L06501. Steig E, Schneider DP, Rutherford SD, Mann M, Comiso JC, and Shindell DT, 2009. Warming of the Antarctic icesheet surface since the 1957 International Geophysical Year. Nature 457, 459-462.